Smart Home Security Camera System: with this IP Camera, you will be able to monitor what\'s going on in your home through live or recorded video by an app on your phone,tablet pc or laptop. 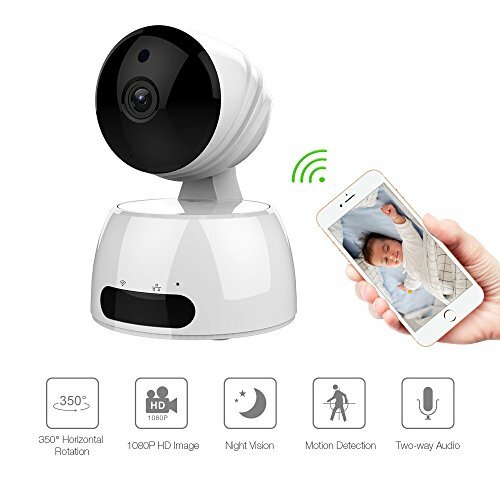 This easy-to-use home security camera can be used as a nanny camera, pet camera, baby monitor and surveillance camera, which is a great tool for keeping an eye on things from afar. 1080P HD Video and Night Vision: Thanks to the camera\'s powerful 1/3 Inch 2.0MP HD CMOS sensor and built-in powerful infrared IR light up to 8 meters you will be able to record sharp 1080p HD images at both day and night. Pan, Tilt and Digital Zoom: Its 350 degree viewing angle in combination with the possibility to rotate the device on both the vertical and horizontal axis guarantees you that the entire room can be easily covered. Smart Motion Detection: with Its intelligent motion detection feature, you\'ll be able to receive alarm notifications if the camera\'s motion detection is triggered when invasion occurs, ensuring you to be constantly up to date about the latest security status of your property.